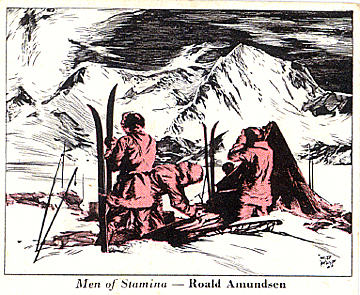 Men of Stamina — Roald Amundsen. 042. MEN OF STAMINA — ROALD AMUNDSEN. Issued by Stamina Self-supporting Trousers. (1946-1966). Card number 90 in Series 16 [76-90]. Size: Ca. 2.5" x 3". Recto: View of three men at camp with skiis, tent, mountains in background.